Warning: I'm about to share something that will be considered controversial. My advice may be counter to the opinions of other agents and certainly insurance companies, but it's important that you know the options before you decide on how to proceed with a claim. Agent: "Blankety Blank Insurance Agency, how may I help you?" Client: "Hi, I'm calling to report a claim. It looks like last night's windstorm blew some shingles off my roof." Agent: "I'm sorry to hear that. How much damage is there?" Client: "Not much. It looks like 4 or 5 shingles at the most". Agent: "Well, your policy states you have a $1,000 deductible. Do you think the damage exceeds this amount? Client: "I really don't think so. I'll tell you what. Let me get an estimate and I'll call you back if I need to make a claim." Agent: "Sounds good. Just let us know, and we'll file a claim." The client then assesses the damage, goes to the local home improvement store and discovers he can purchase shingles for about $50. They aren't a perfect match, but it's pretty close (plus he's not even sure how to determine the exact make of the shingles since the previous owner installed the roof). He decides to make the repairs himself, and never calls the agent about it again. Pretty simple, right? The roof is fixed at a cost that is clearly less than the deductible and the client goes about his life. So, what's the problem? Let me tell you. Let's say that same client has a similar wind loss 4 or 5 years later, but this time, it's more significant; half the roof is gone. To complicate matters, the original shingles are no longer available. The color has been discontinued. 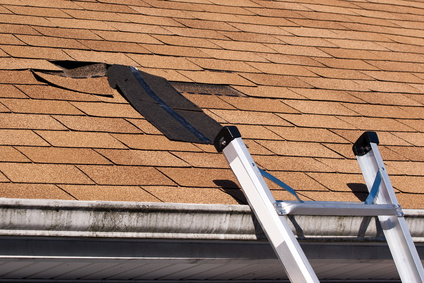 Ordinarily, insurance companies will replace the entire side of the roof slope that was damaged, including undamaged shingles. In some cases, the entire roof would be replaced. Why do companies do this? The State of Ohio has a law which requires insurance companies to do their best to give a reasonable effort to make a client whole when it comes to a claim. However, many companies will cite the same law to argue this standard of care isn't required for roofs that don't match at the time of loss. The client in our example above had replaced prior damage with unmatched shingles. In this case, there is a very real possibility that the insurance company will only pay for the repair of the damaged shingles in the new claim. They won't replace the entire roof because the roof already doesn't match. Repairing the original claim with unmatched shingles eliminated the need for the insurance company to make the extra effort to make the roof uniform. The result? A roof with a patchwork of three different color shingles. Frankly, the original claim should have been handled differently once the client could not find shingles that matched. At that point, a call to the agent should have been made, so that a claim could be filed. An experienced adjuster would have taken a sample of the shingle and determined its availability. If a match didn't exist, the company would have more than likely been required to, at least, replace the entire side of the affected roof. Again, in some cases the entire roof might even have been replaced. Keep in mind; it's hard to predict the future, and there are repercussions whenever a claim is filed and paid out. There may never be a second claim for most. Regardless, please call us if you find yourself in a similar situation. After discussing the situation, we may recommend filing the claim. If for no other reason than to have an experienced adjuster help you determine whether or not your shingles are still available. If they are, your repair costs will be small, and the claim can be closed. However, if they aren't, he/she will address claim settlement options which will make you whole, and protect you from a possible claim denial, or limitation in the future. As a reminder; please send us documentation when you install a new roof (or make any home improvements). We will keep it in our files for reference should something like this occur to you.